Password resets are common service desk request IT engineers deals with. Passwords are weak authentication method. Passwords are breakable, crackable and guessable. 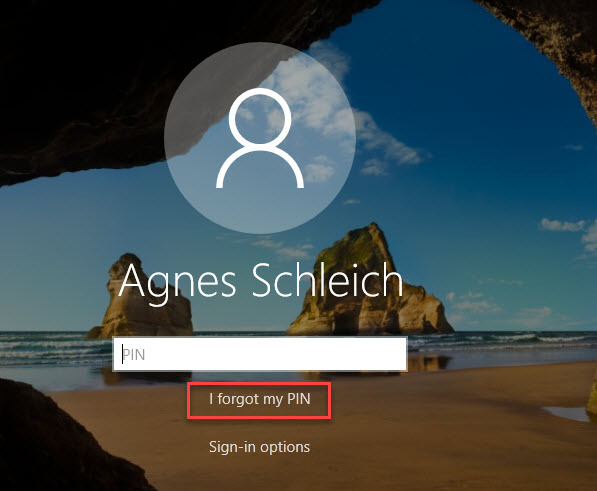 This is why Microsoft invested on password less authentication such as Windows Hello. However, majority of systems still use traditional user name and password to authenticate. When user forget their password, it prevents them from accessing the systems or services they trying to access. Until someone with higher privileges reset user’s password his/her time will be wasted. It is manageable for small number of users but if its large organization, it can cost lot for both parties. This is why organizations use self-service password reset solutions. It will allow its users to reset their passwords in secure, controlled environment. 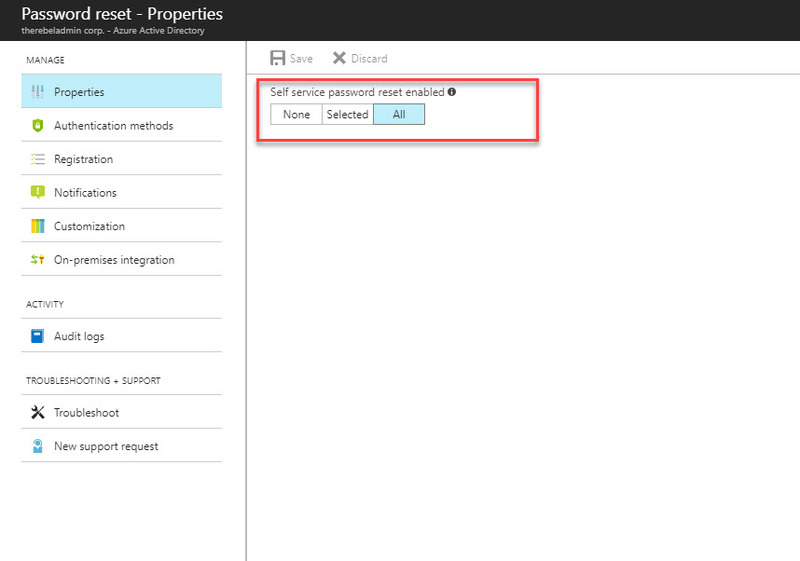 When it comes to Azure AD, it also can allow users to have self-service password reset feature. In one of my previous blog post I explained how it can enable. 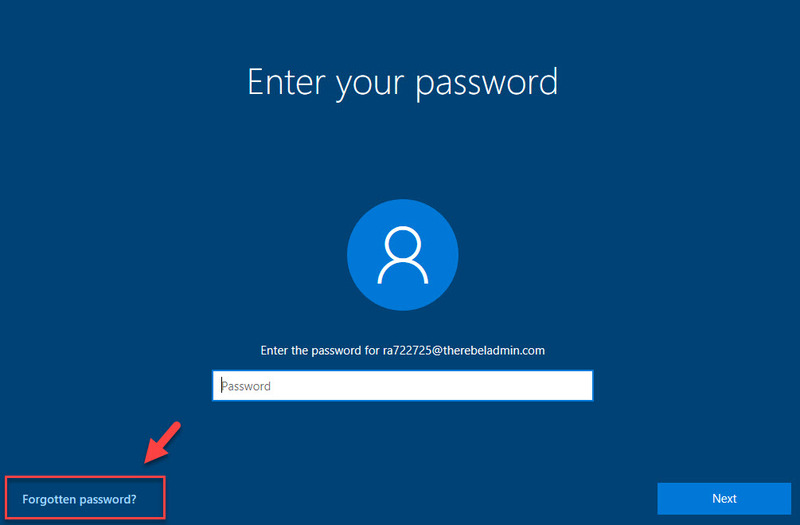 It can access using http://www.rebeladmin.com/2016/01/step-by-step-guide-to-configure-self-service-password-reset-in-azure-ad/ . 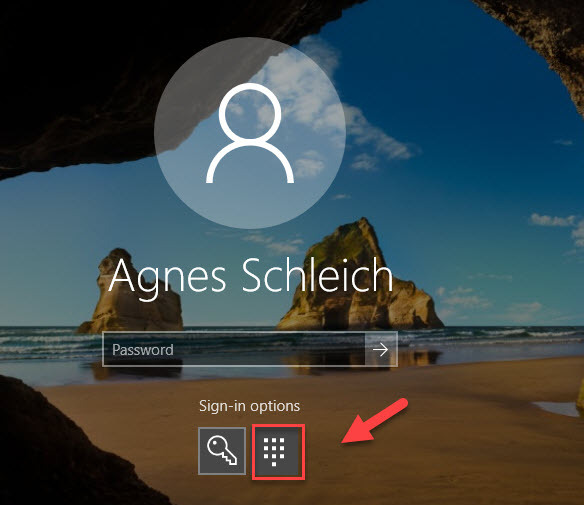 Now Azure AD also allows to reset password directly from login screen of Azure AD join windows 10 devices. In this post, I am going to demonstrate this feature. 1. 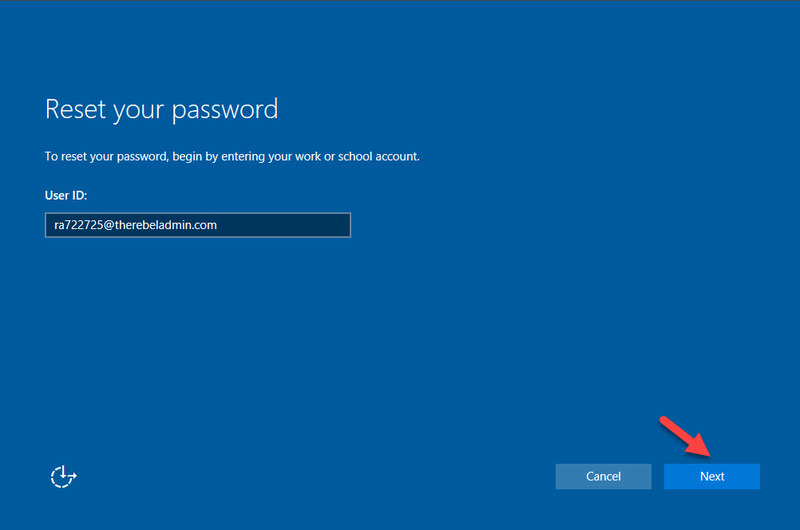 Enable self-service password reset – By default Azure AD do not have this feature enable. It need to enable before users use this feature. It can be enable for all the users or group of users. In my demo environment, I have it enable for all the users. 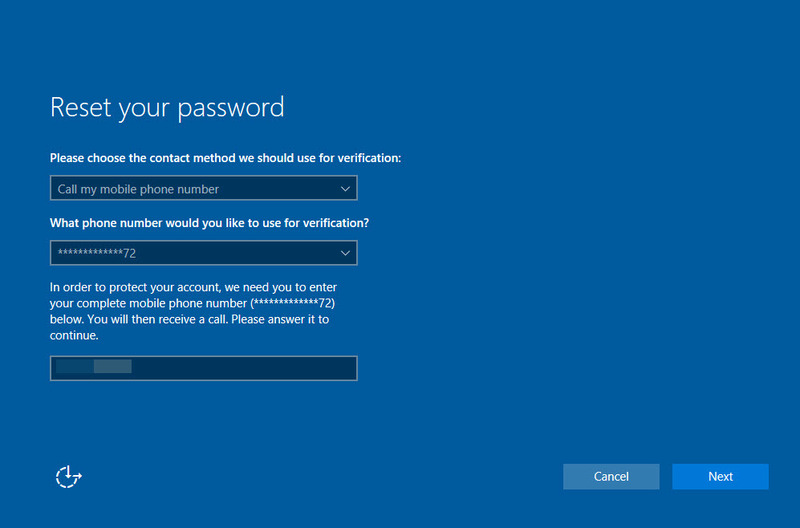 Also in here users can have one or two authentication methods to reset password. if it’s using two methods, it will verify user using both methods. 2. 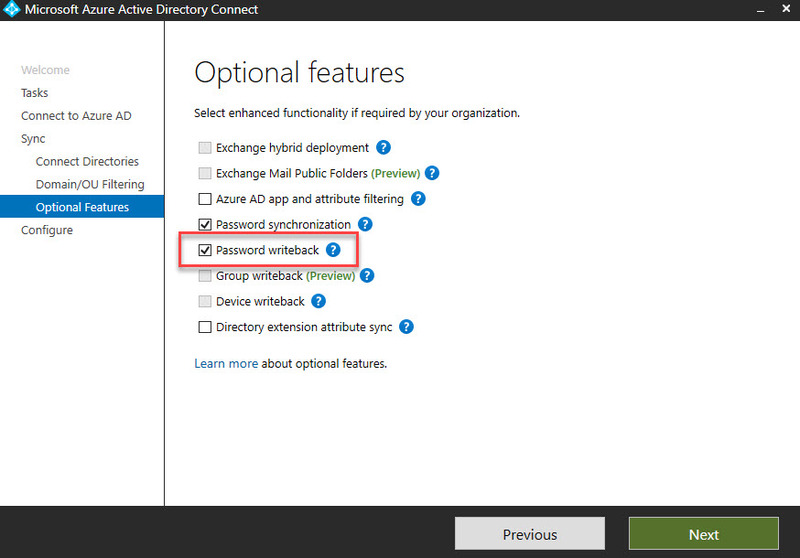 Password writeback for Hybrid Environments – If its Hybrid environment (with on-premises AD) password writeback option should enable. 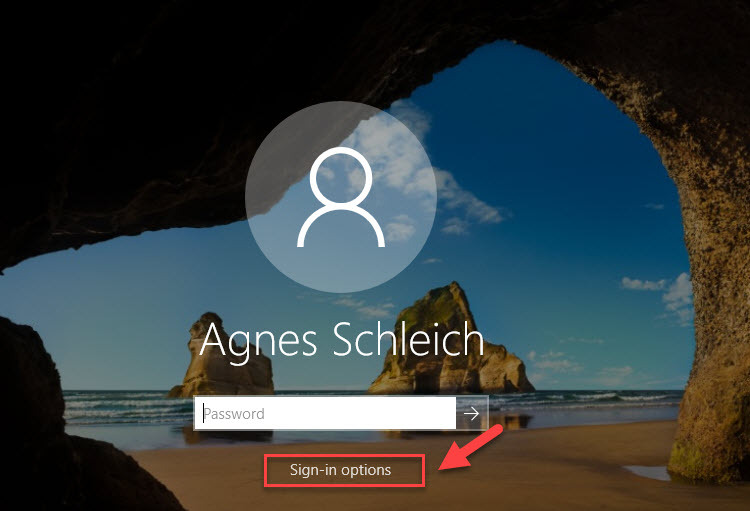 Otherwise password which reset from Azure AD will not replicate back. 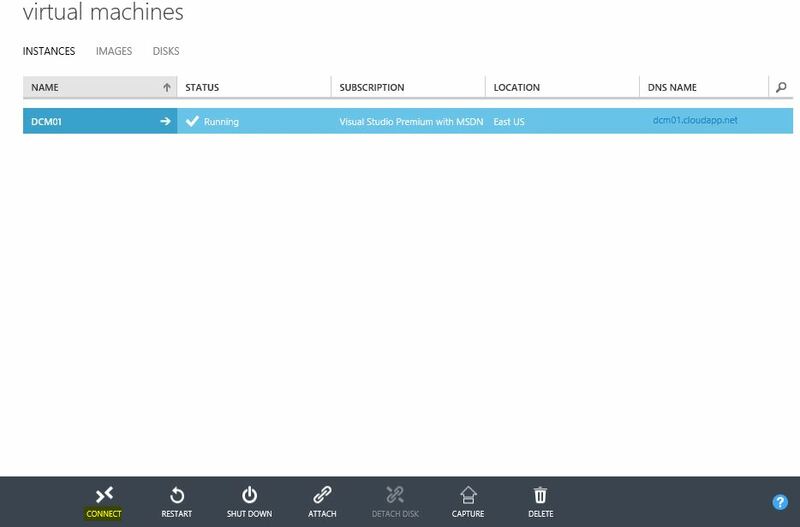 This option is available in Azure AD connect. If you not enable this option, even if you have self-service password reset enable it will not allow password reset for users. 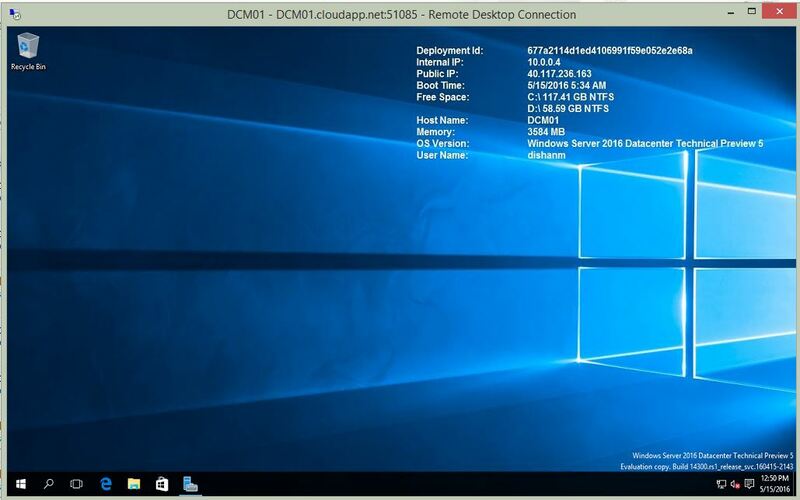 In my demo environment, I have an Azure Domain Join Windows 10 PC. on my login, it says I need to provide additional info for password recovery. Click on Set it up now to continue. Then it provides list of options I can use to verify. Select the option you need and click Next. Now we have recovery options setup, let’s see how password reset works from the device. Then click on number pad sign to select PIN option. Then click on I forgot my PIN option. I know this is confusing as we trying to reset password. but unfortunately, option is in PIN reset page. Then it will open new window. In their click on Forgotten password option. 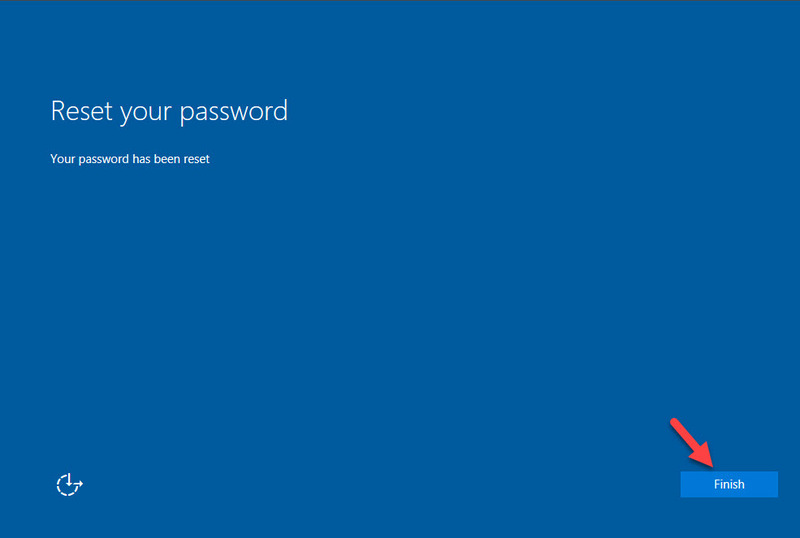 Now it opens a new window to reset password. click Next to proceed. Then it gives option for verification. Select the method you like to use. You can’t change your registered data in here. After successful verification, it gives option to define new password. after type new password, click on Next to proceed. Then click on Finish to complete the process. Then I can login to device with new password. Cool ha?? ?, as expected we were able to reset password on device login screen. This marks the end of this blog post. If you have any questions feel free to contact me on rebeladm@live.com also follow me on twitter @rebeladm to get updates about new blog posts. When organizations want to use same user name and passwords to log in to on-premises and cloud workloads (azure), there are two options. One is to sync user name and password hashes from on-premises active directory to azure AD. Other option is to deploy ADFS farm on-premises and use it to authenticate cloud based logins. But it needs additional planning and resources. On-premises AD uses hash values (which are generated by a hash algorithm) as passwords. They are NOT saved as clear text, and it is almost impossible to revert it to the original password even someone have hash value. There is misunderstanding about this as some people still think Azure AD password sync uses clear text passwords. Every two minutes, the Azure AD connect server retrieves password hashes from the on-premises AD and syncs it with Azure AD on a per user-basis in chronological order. In technical point of view, I do not see a reason why people should avoid password hash sync to azure AD. However, there are company policies and compliance requirements which do not accept any form of identity sync to external system even on hash format. 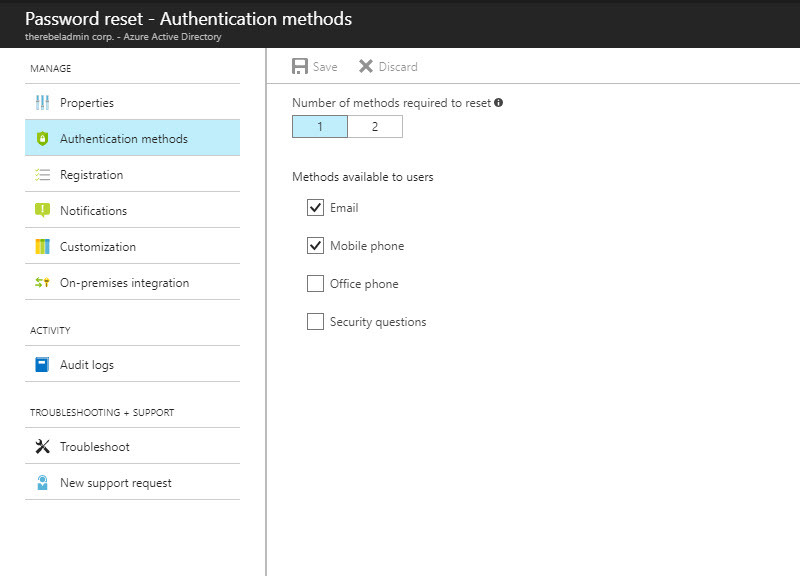 Azure Active Directory Pass-through Authentication is introduced by Microsoft to answer these requirements. 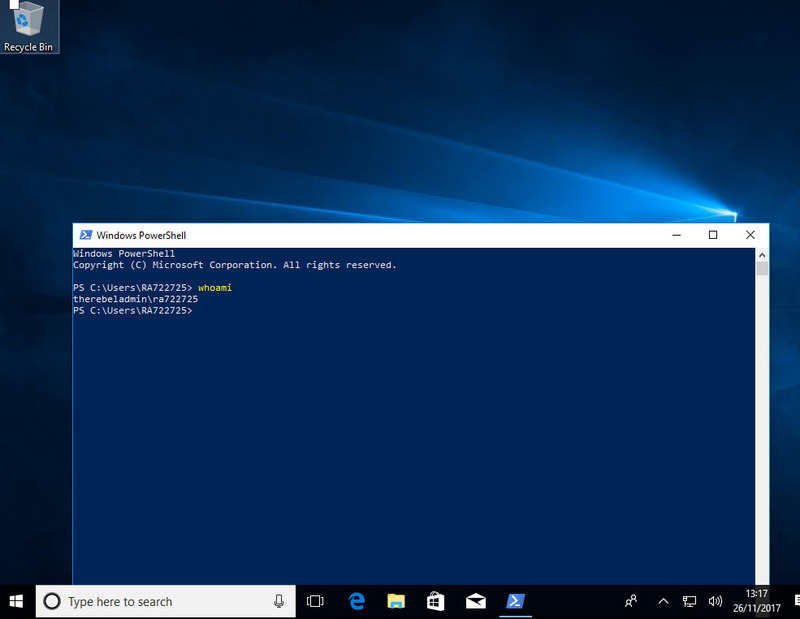 It allows users to authenticate in to cloud workloads using same passwords they are using in on-premises without syncing their password hash values to Azure AD. This feature is currently on preview. Which means it’s still not supported on production environment. But it is not too early to try it in development environments. According to Microsoft, following can list as key features of Pass-through Authentication. • Users use the same passwords to sign into both on-premises and cloud-based applications. • Users spend less time talking to the IT helpdesk resolving password-related issues. • Users can complete self-service password management tasks in the cloud. • No need for complex on-premises deployments or network configuration. • Needs just a lightweight agent to be installed on-premises. • No management overhead. The agent automatically receives improvements and bug fixes. • On-premises passwords are never stored in the cloud in any form. • The agent only makes outbound connections from within your network. Therefore, there is no requirement to install the agent in a perimeter network, also known as a DMZ. 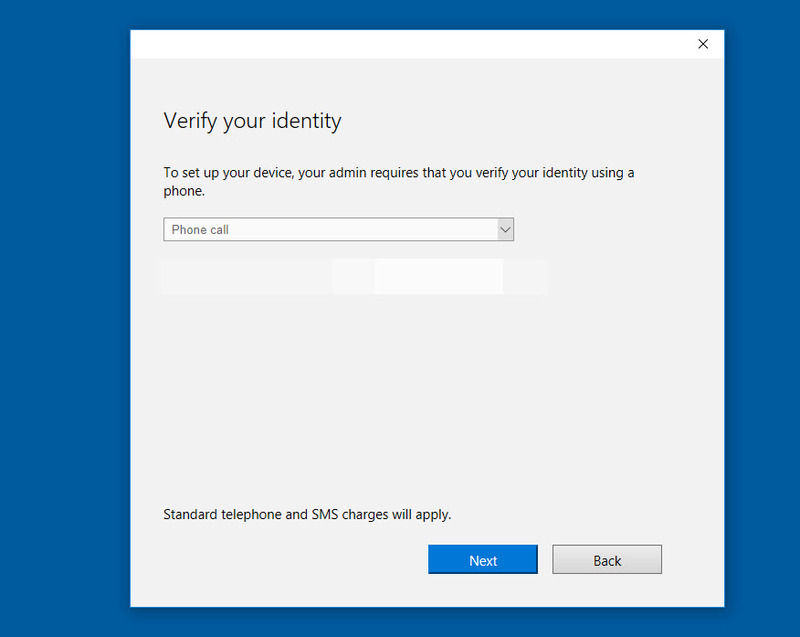 • Protects your user accounts by working seamlessly with Azure AD Conditional Access policies, including Multi-Factor Authentication (MFA), and by filtering out brute force password attacks. • Additional agents can be installed on multiple on-premises servers to provide high availability of sign-in requests. • Multi-forest environments are supported if there are forest trusts between your AD forests and if name suffix routing is correctly configured. 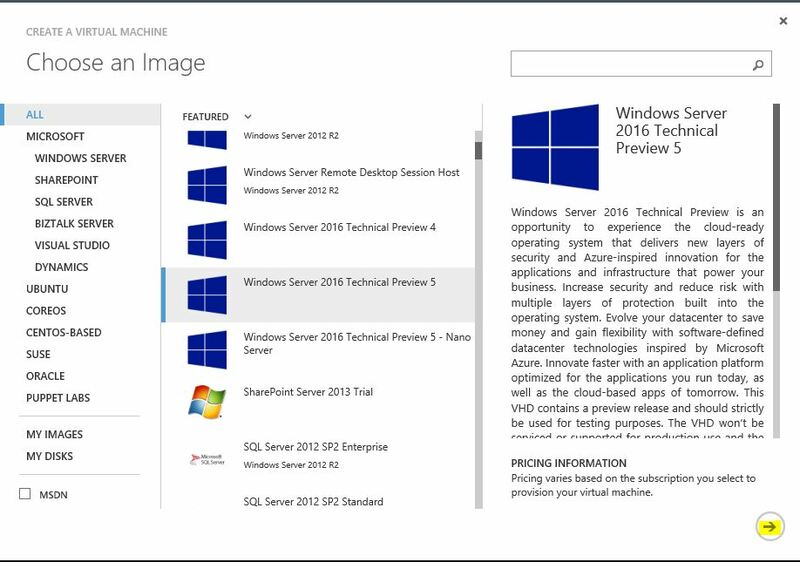 • It is a free feature, and you don't need any paid editions of Azure AD to use it. 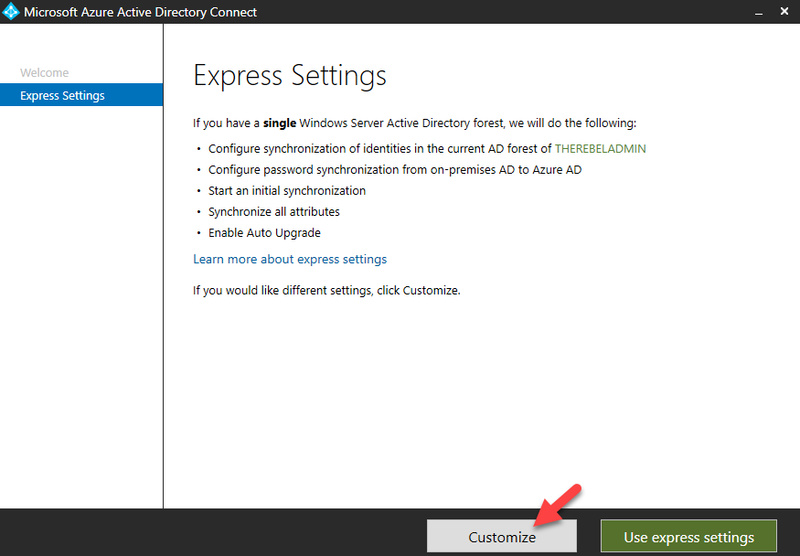 • It can be enabled via Azure AD Connect. • It protects your on-premises accounts against brute force password attacks in the cloud. Let’s see how it really works. In following example, user is trying to access cloud based application (integrated with azure) using his on-premises username and the password. This organization is using pass-through authentication. 1. User is accessing the application URL using his browser. 2. 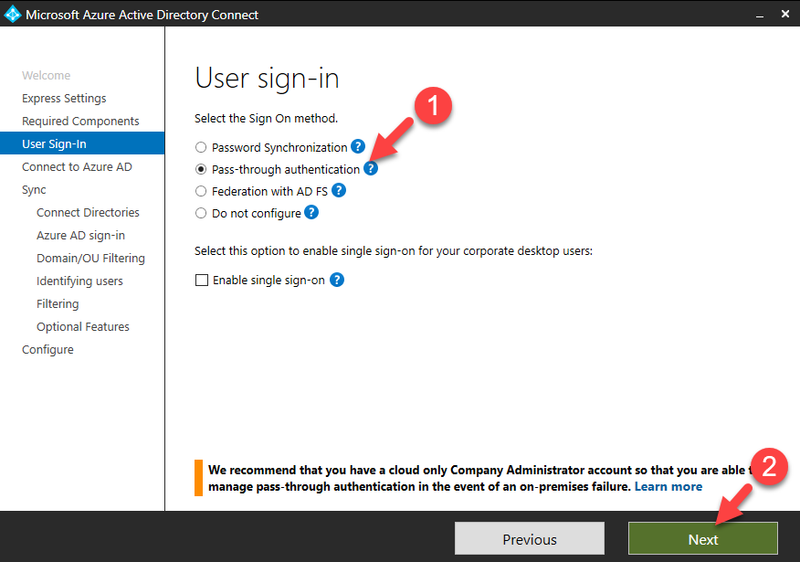 In order to authenticate to the application, user is directed to Azure Active Directory sign-in page. User then type the user name, password and click on sign-in button. 3. Azure AD receives the data and it encrypt the password using public key which is used to verify the data authenticity. Then it places it’s in a queue where it will wait till pass-through agent retrieves it. 5. Agent decrypt the password using private key available for it. 6. 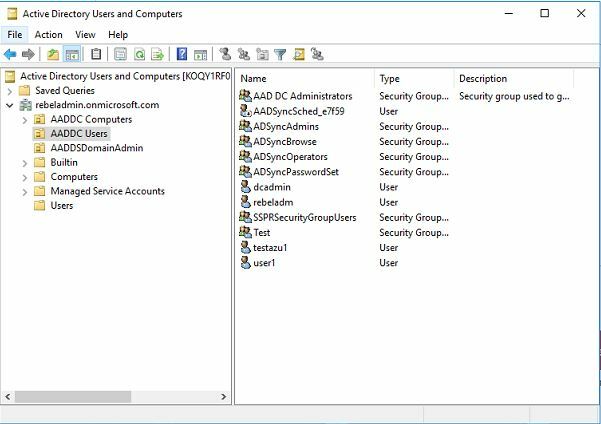 Agent validates the user name and password information with on-premises Active Directory. It uses same mechanism as ADFS. 7. On-premises AD evaluate the request and provides the response. It can be success, failure, password-expire or account lockout. 8. Pass-through agent passes the response back to Azure AD. 9. Azure AD evaluate response and pass it back to user. 10. If response was success, user is allowed to access the application. 2. 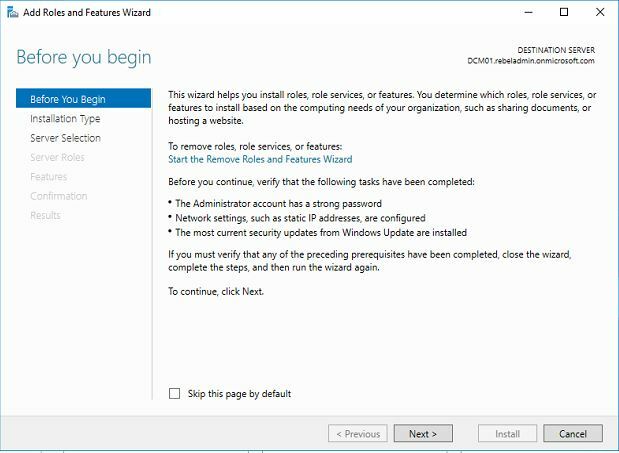 Global Administrator Account for Azure subscription – in order to create custom domain, configure AD connect etc. 3. 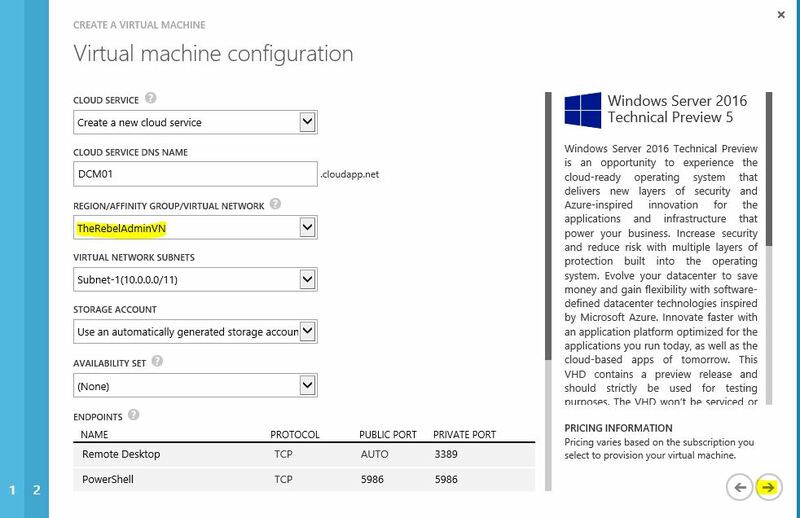 On-premises servers running windows server 2012 R2 or latest to install Azure AD connect and pass-through agent. 4. Latest Azure AD Connect https://www.microsoft.com/en-us/download/details.aspx?id=47594 – if you have older Azure AD connect version installed, you need to upgrade it to latest before we configure this feature. Once we have all the prerequisites ready, we can look in to configuration. if you running Azure AD connect for first time make sure to use custom method. Then in User sign-in option, select pass-through authentication and continue. 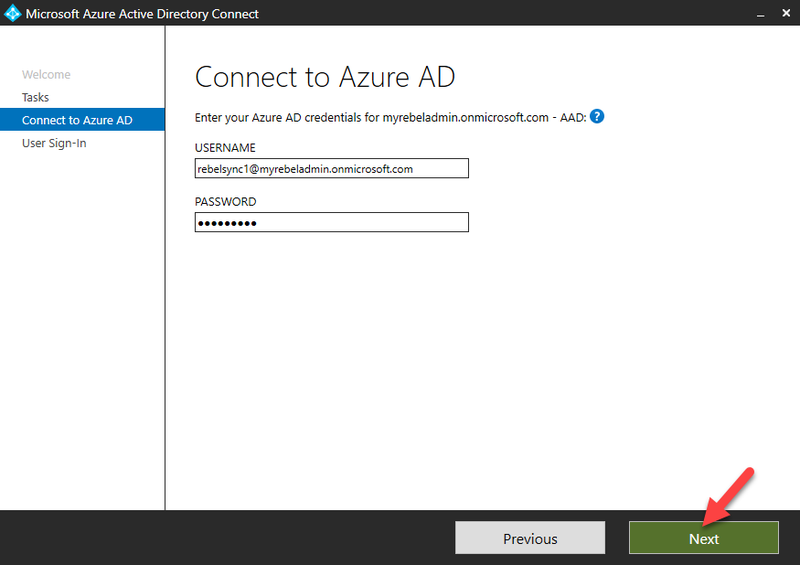 If you running it already in servers, first run as Azure AD Connect as administrator. Then click on Configure. Then in next page, select Change user sign-in option and click Next. 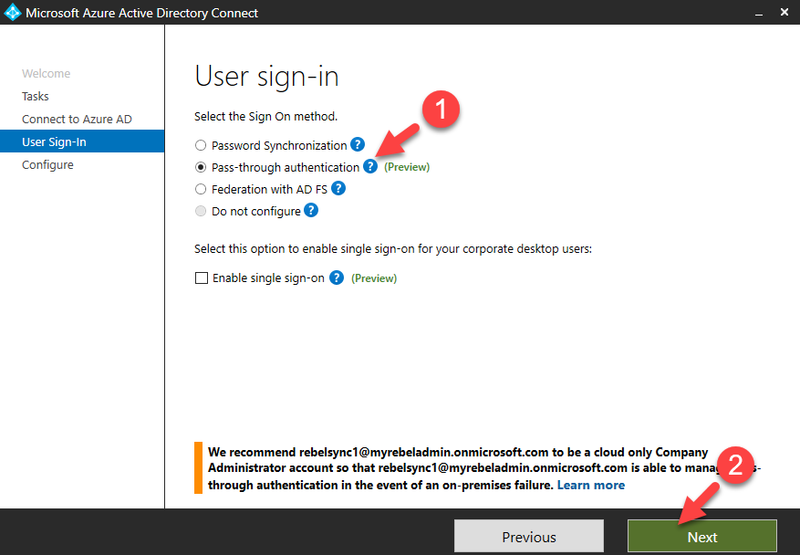 In next window type the Azure AD sync account login details and then click Next. 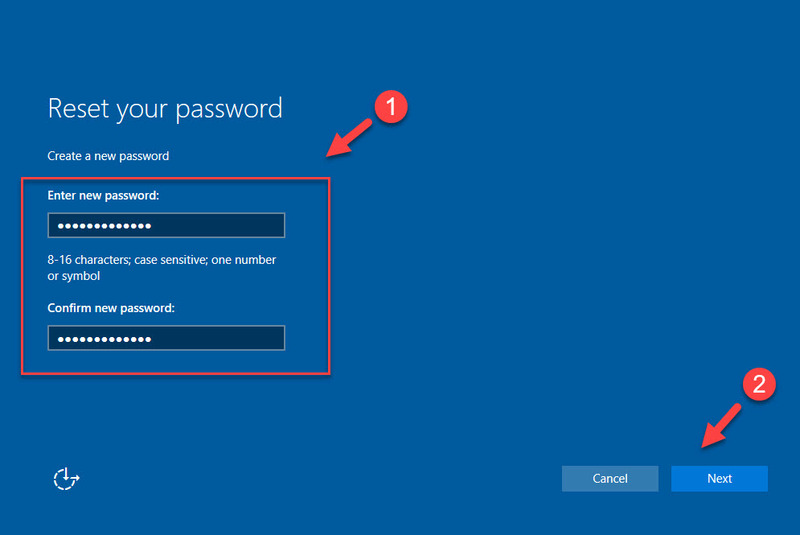 In next window, select pass-through authentication and click Next. 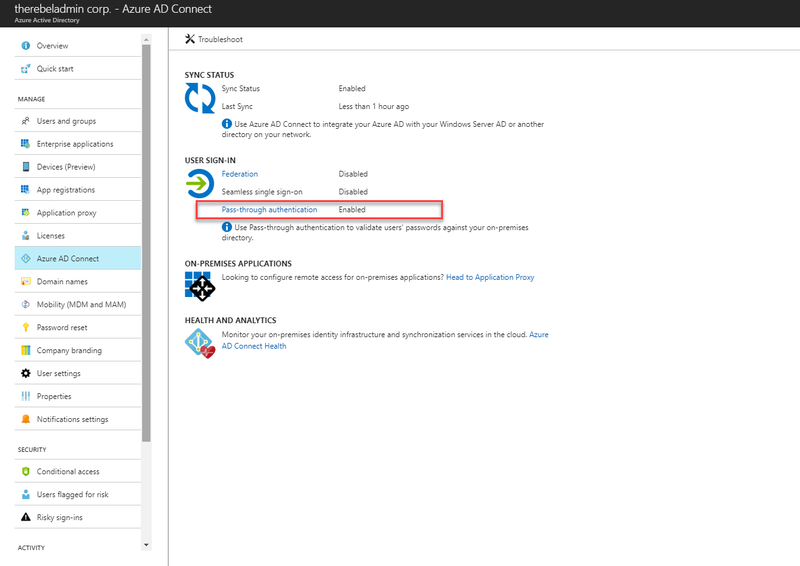 Note– If you have Azure AD App Proxy Connector installed on same Azure AD connect server you will receive error saying, Pass-through authentication cannot be configured on this machine because Azure AD Connect agent is already installed. 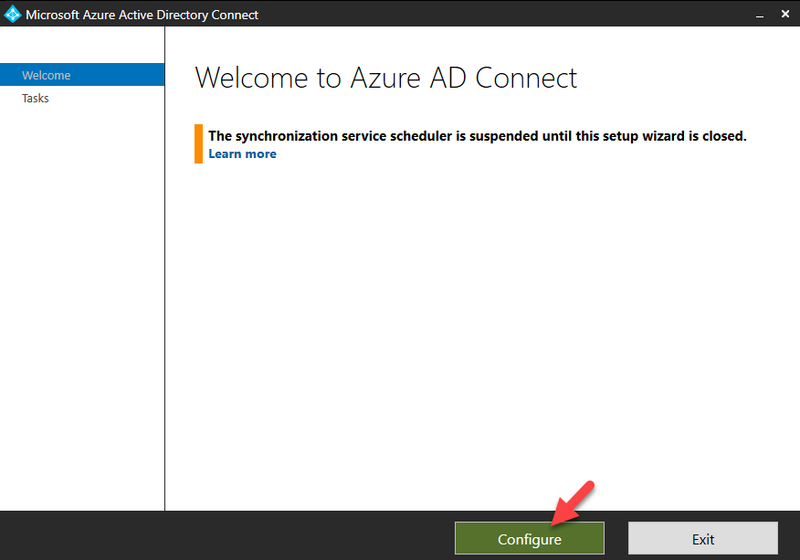 To fix it uninstall the Azure AD proxy connector and then reconfigure AD connect. After that you can reinstall Azure AD App proxy Connector. Once it finishes the configuration click on configure to complete the process. 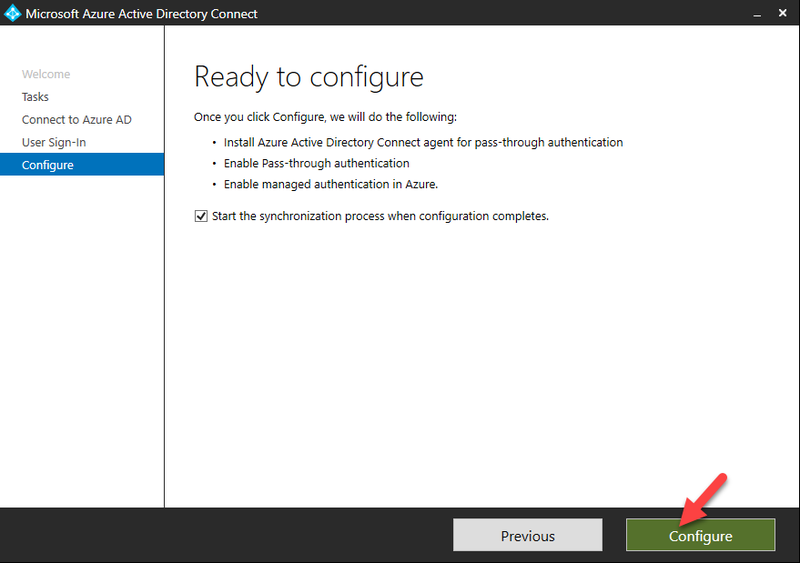 Once process is completed, log in to Azure Portal and then go to Azure Active Directory > Azure AD Connect. In there we can see pass-through authentication is enabled. And if you click on there it will shows the connected agents status. At this stages users from on-premises should be able to sign in to their cloud applications by using pass-through authentication. in order to add high availability, we can install agent in multiple domain join servers. it can download from pass-through authentication page. In this post, I am going to explain about another set of cmdlets and the ways to use. 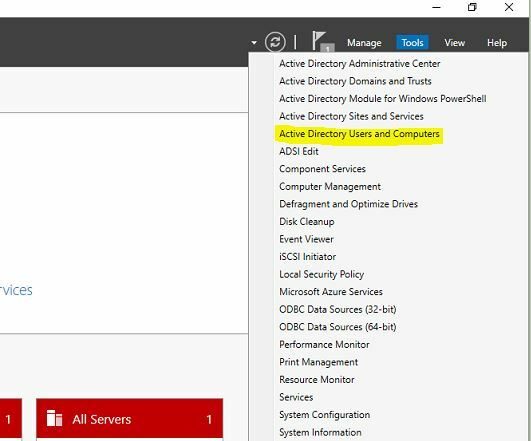 Some of the commands which we use for on-premises Active Directory Management works for Azure Active Directory too. only difference is the cmdlet itself. As an example, in on-premises AD, we use New-ADUser to add user, in Azure AD it becomes New-​Msol​User. If you like to know further about command and its use, easiest way to start is using following commands. In order to create a user, you need to connect to Azure AD with a user who has “Global Admin” role. In above command UserPrincipalName specify the UPN and user password s set not to expire. It is obvious sometime we need to change password of an existing account. Set-MsolUserPassword -UserPrincipalName "jeffm@therebeladmin.com" -NewPassword "pa$$word"
The above command will reset the password for the jeffm@therebeladmin.com in to new password. Instead of specifying password, following command will generate random password and force user to reset it on next login. 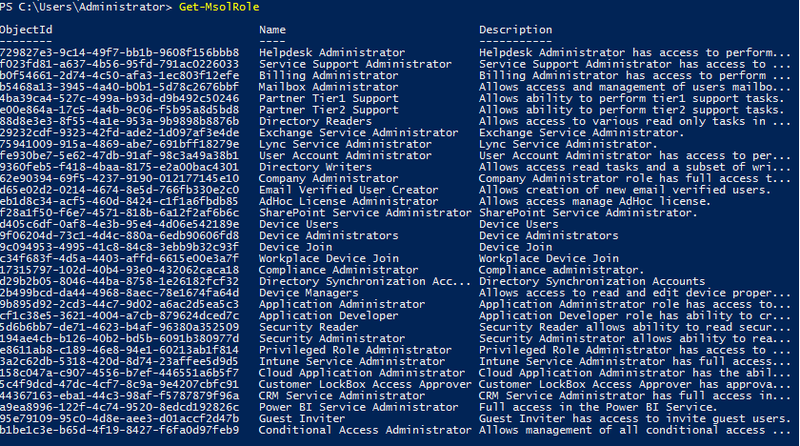 Azure Active Directory does have predefined administrative roles with different capabilities. This allows administrators to assign permissions to users to do only certain tasks. According to requirements, we can add users to these administrative roles. 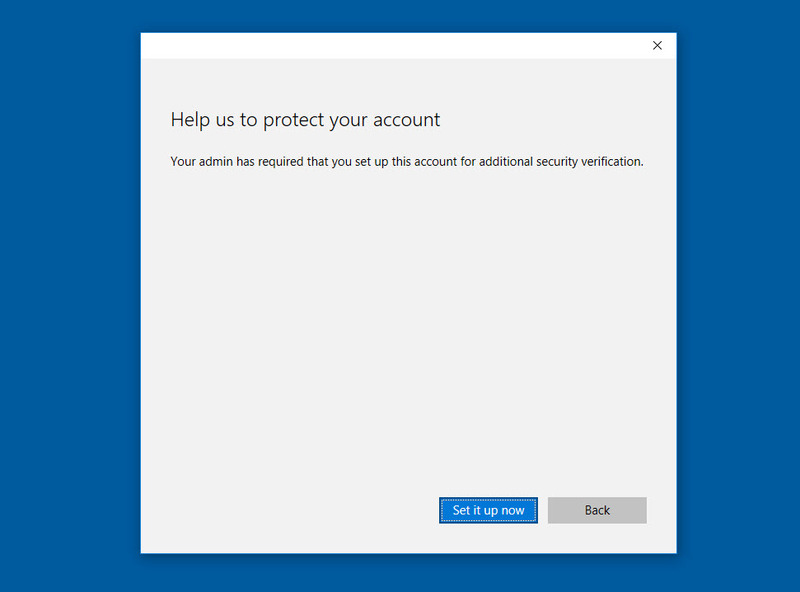 Add-MsolRoleMember -RoleName "User Account Administrator" -RoleMemberObjectId "e74c79ec-250f-4a47-80dd-78022455e383"
Above command will add user with object id e74c79ec-250f-4a47-80dd-78022455e383 to the role. In order to view existing members of different administrator roles, we can use command similar to below. $RoleMembers = Get-MsolRole -RoleName "User Account Administrator"
This will list down the users with User Account Administrator role assigned. Apart from the roles, AD also have security groups. New-MsolGroup -DisplayName "HelpDesk" -Description "Help Desk Users"
A group contains members. We can add members to group using commands similar to below. This will add user with object id e74c79ec-250f-4a47-80dd-78022455e383 to group with object id a53cc08c-6ffa-4bd6-8b03-807740e100f1. In order to remove member from the security group we can use Remove-MsoLGroupMember cmdlet. In order to remove a user from administrator role we can use Remove-MsolRoleMember cmdlet. Remove-MsolRoleMember -RoleName "User Account Administrator" -RoleMemberType User -RoleMemberObjectId "e74c79ec-250f-4a47-80dd-78022455e383"
This is the end of the part 2 of this series. In next part, we will look further in to Azure AD management with PowerShell. 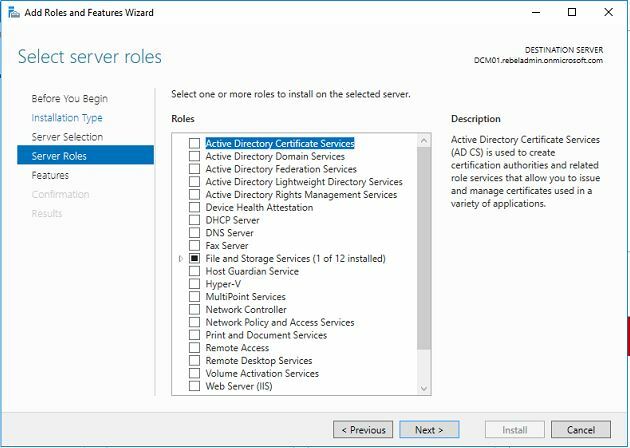 In my recent articles I was explaining how to enable Azure Active Directory Domain Service and how to manage its services using domain-joined server. If you not read it yet please check my last post in here. 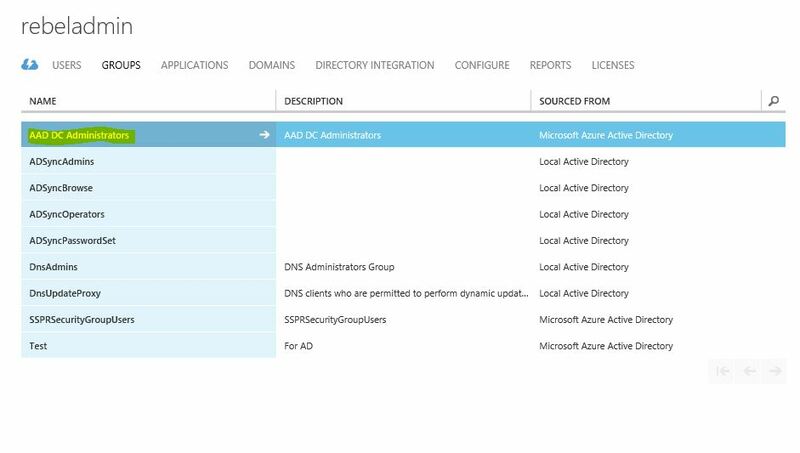 When you manage a local active directory instance, using DNS mmc you can manage the DNS records. But can we do same with Azure managed domain? Answer is yes. 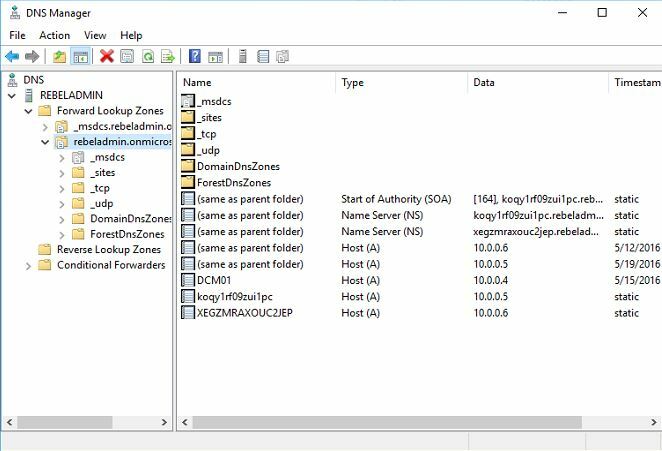 In this post I am going to show how to manage dns records using domain-joined azure vm. In order to do that we need following prerequisites. I have explain all of above in my last 3-4 posts. Please follow them if you like to know more about those. 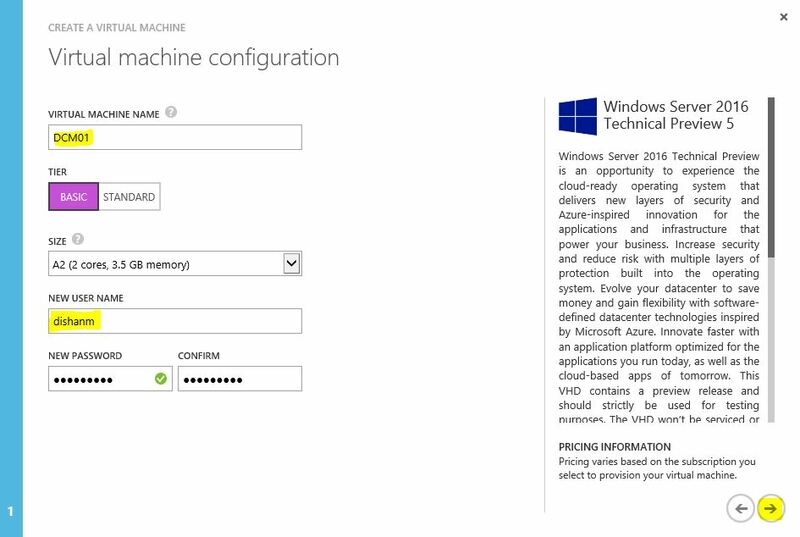 So in this demo, I am going to use the already setup Azure managed domain instance. 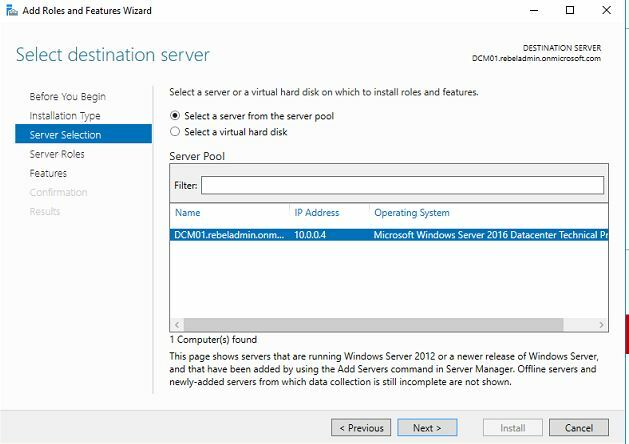 I also have a virtual server running on Azure with windows server 2016 TP5. It is already jointed to the managed domain. 11) It will open up the DNS mmc. In here we can manage the DNS records as we need. There are some dns records which related to the managed domain service. So make sure those records are not modified or deleted. 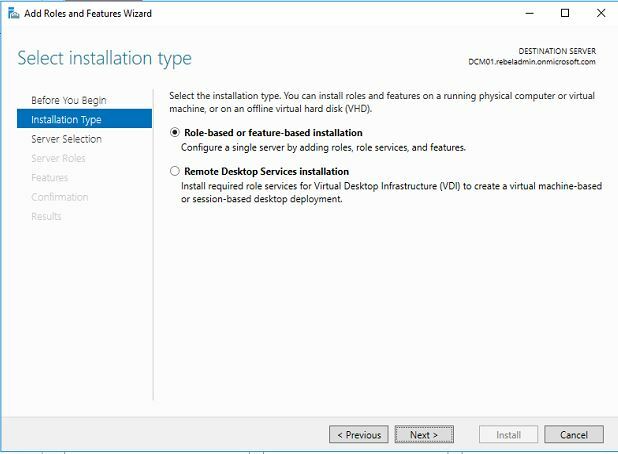 The virtual machine no need to be on server version, if you install desktop version you can still managed dns by installing RSAT tools. 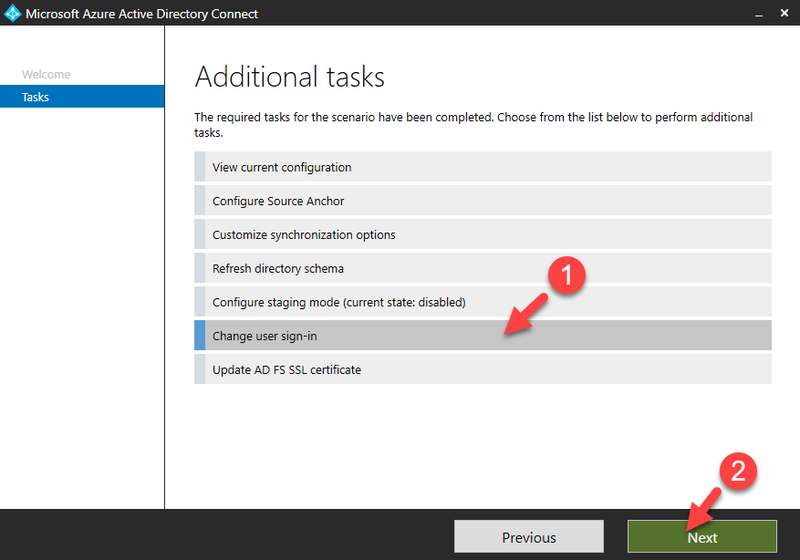 In my last two blog post I explain how to enable Azure Active Directory Domain Service and how to configure it properly. If you still not read those you can find those in following links. 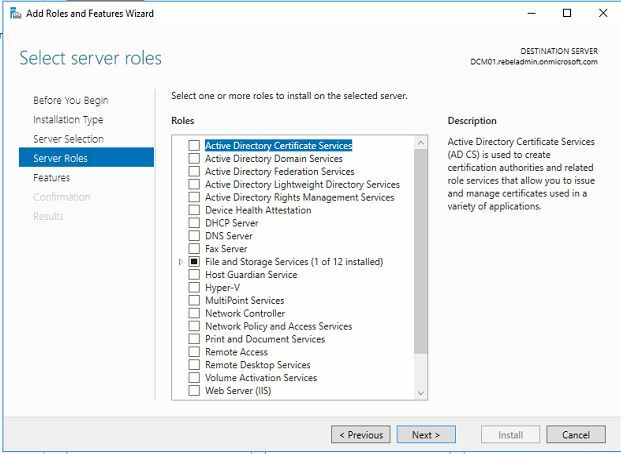 In this post I am going to demonstrate how to add a virtual server which is setup on azure in to the managed domain and how to use Active Directory administration tools to manage the AAD-DS managed domain. One thing I need to make clear is since it’s a managed domain services you do not going to have same manageability as in house domain controller. • Join machines to the managed domain. 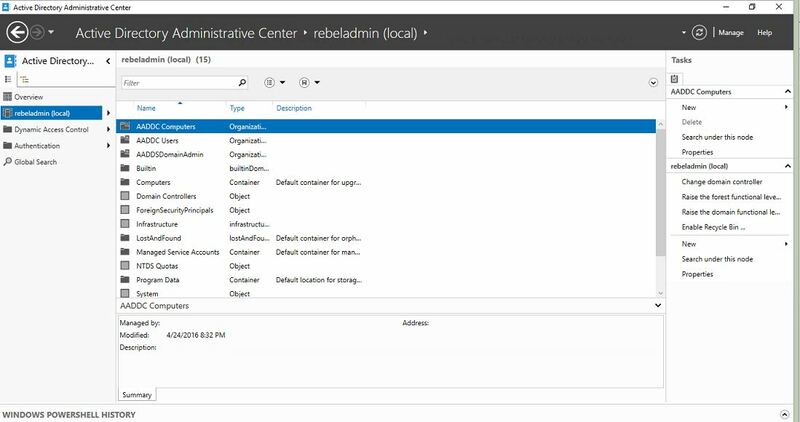 • Configure the built-in GPO for the 'AADDC Computers' and 'AADDC Users' containers in the managed domain. 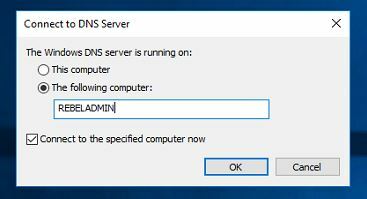 • Administer DNS on the managed domain. 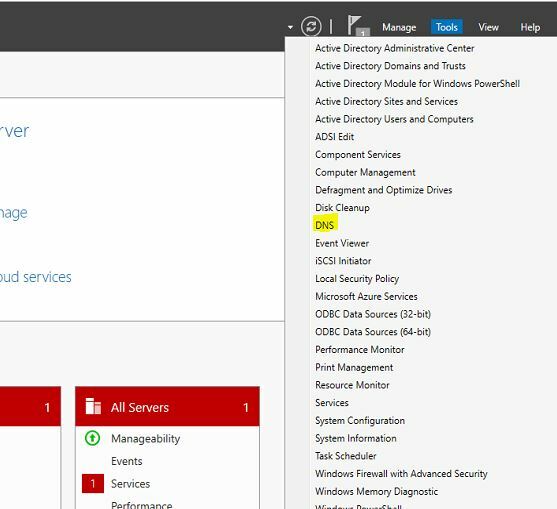 • Create and administer custom Organizational Units (OUs) on the managed domain. • Gain administrative access to computers joined to the managed domain. • You are not granted Domain Administrator or Enterprise Administrator privileges for the managed domain. • You cannot extend the schema of the managed domain. 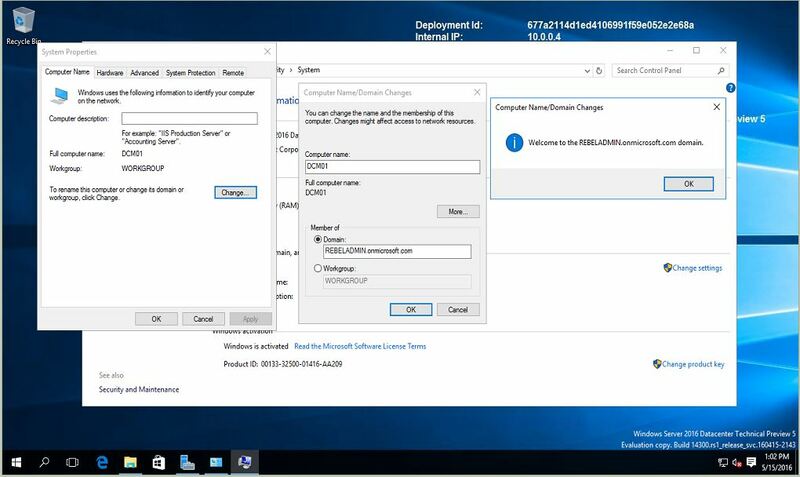 • You cannot connect to domain controllers for the managed domain using Remote Desktop. 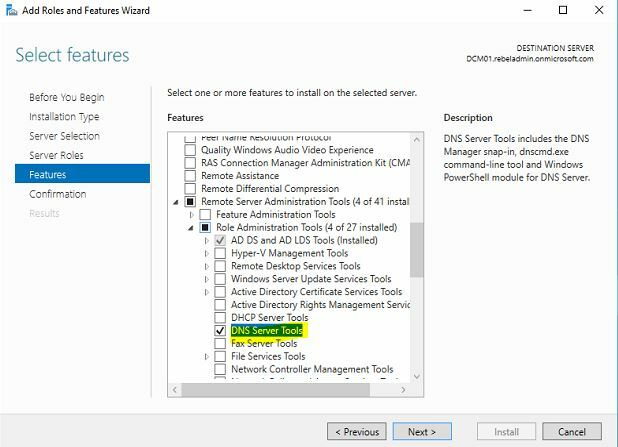 • You cannot add domain controllers to the managed domain. 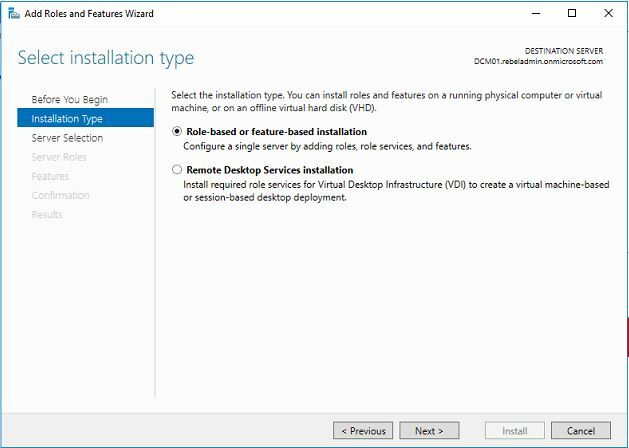 As the first step I am going to setup new VM under the same virtual network as the managed domain. 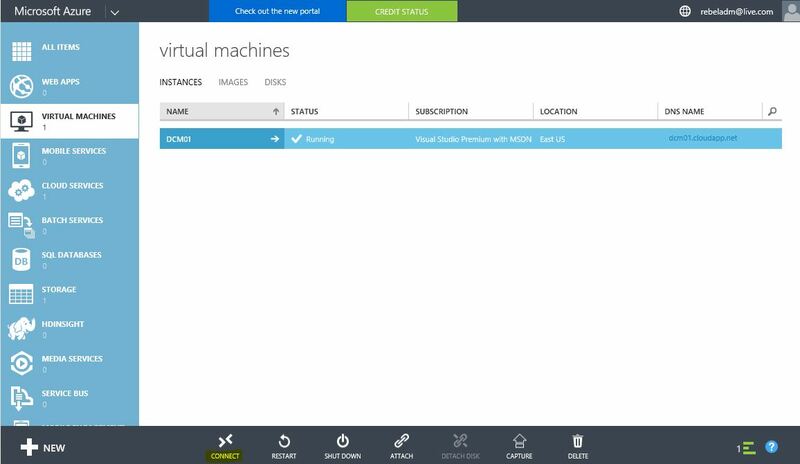 1) In order to join VM to the same virtual network, we have to use Azure classic portal to build the VM. 3) Then select the template from the list. 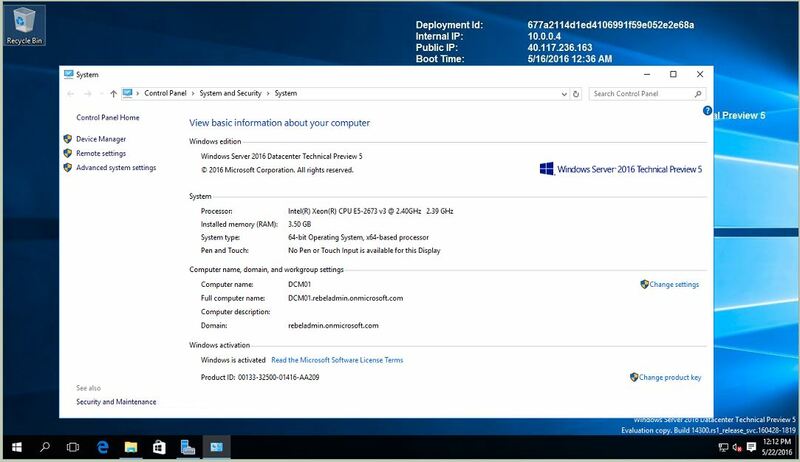 I am going to use windows server 2016 TP 5. Click on arrow to proceed. 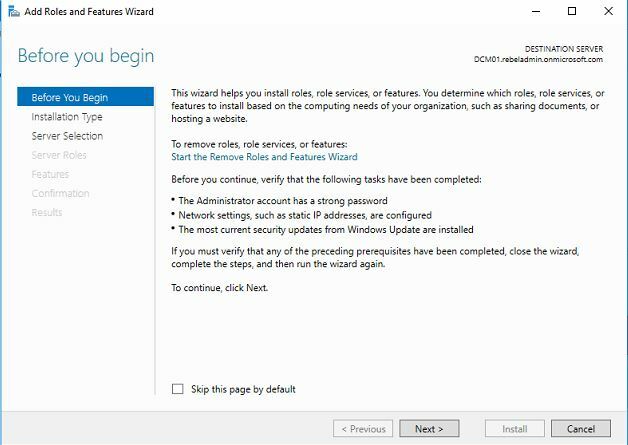 4) In next window provide the info for the new VM (such as name, resources and local admin account) and click proceed arrow. 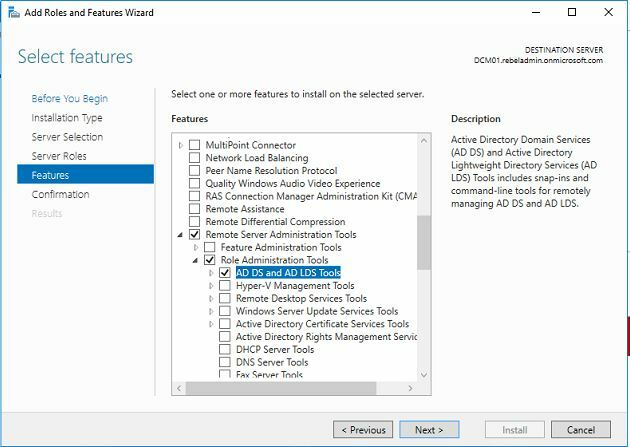 5) In Next window select the Virtual network as same as the one you setup the AAD-DS managed domain. 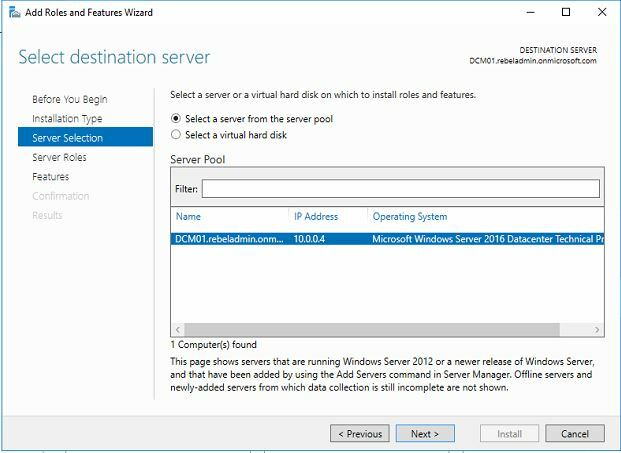 If you do not select correct virtual network you will not be able to connect this vm to the managed domain. Once done, click on button to proceed. 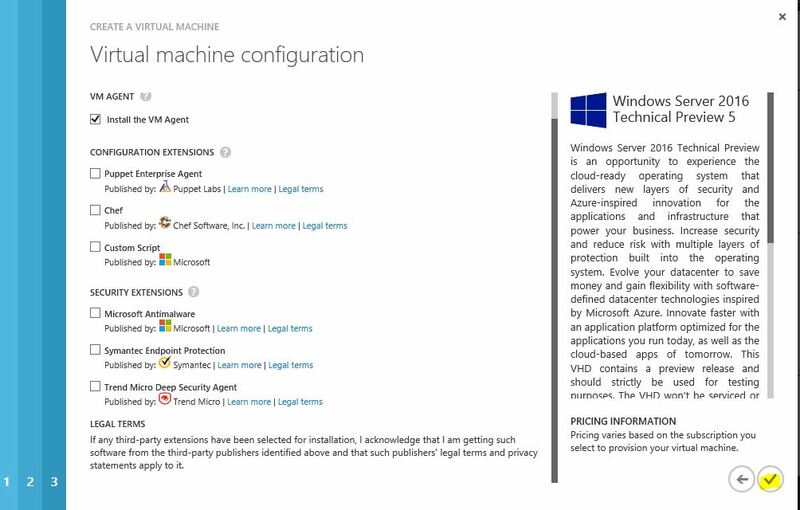 6) In next window can add the extensions you like and click to button to setup the vm. 2) Now the server is ready, next step is to join it to the domain. 4) Once connected to the domain, reboot it to complete the process. 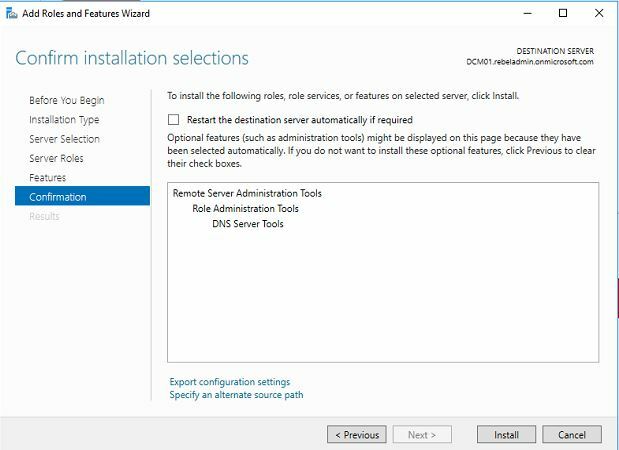 In this step I am going to install AD admin tools using that we can manage the Azure managed domain. 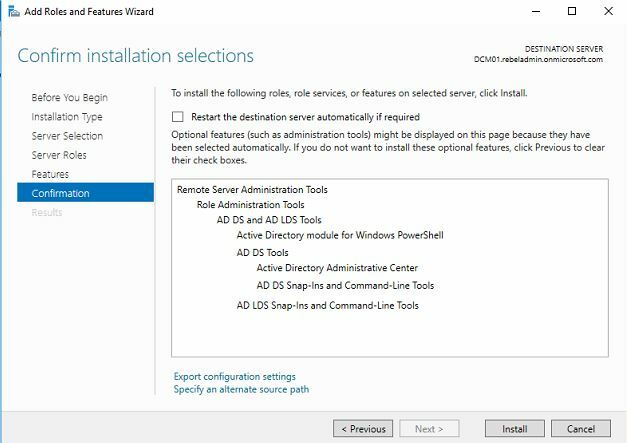 7) In features select Remote server administration tools > Role administration tools > AD DS and AD LDS Tools and then click next to proceed. Here we can see the AD console which Admins familiar with.